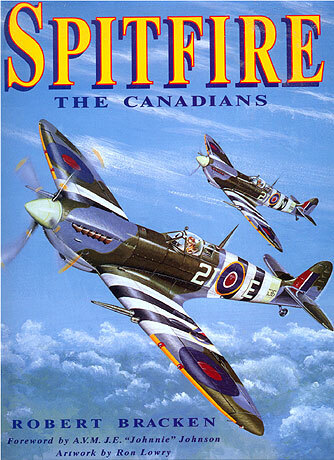 Media: Spitfire the Canadians - Hardcover Book of 160 pages; black & white wartime photographs; two colour plates; 39 colour profiles (colour profile artwork by Ron Lowry); scale plans by A.R. Clint. 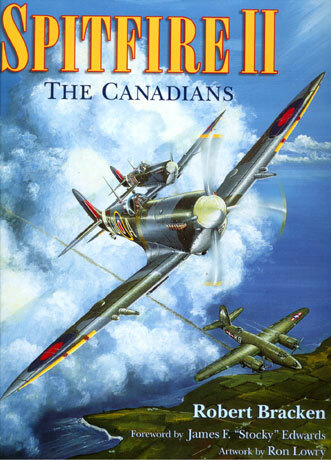 Spitfire II the Canadians - Hardcover Book of 137 pages; black & white wartime photographs plus 9 stunning wartime colour photos; two colour plates; 9 colour profiles. Colour profile artwork by Ron Lowry. Spitfire - The Canadians and Spitfire II - The Canadians both take an identical approach to the subject of Spitfires flown by Canadian pilots. Both books are presented in hard cover, 12" x 9" format with high-quality glossy pages. The author, Robert Bracken, exclusively uses the first-hand stories of the pilots to establish a sweeping and vivid impression of Spitfire operations wherever Canadians were stationed. 58 individual stories are related in the first book, while 37 are told in Spitfire II. The stories in both books are mutually exclusive - the episodes in each cover from the Battle of Britain to the cessation of hostilities. The text has been skilfully edited to retain the first-hand impressions while remaining entertaining and readable. A thread of wry humour runs through some of these articles, in addition to a fair share of honest self-reflection. Modellers will appreciate the large number of high quality, beautifully reproduced wartime photos in each book. Most of these are at least a half-page in size, with many full-page photographs displaying terrific detail. The photographs are supported by Ron Lowry's attractive colour profiles - 39 in the first book and 9 in the second. These will provide ample inspiration for modelling subjects ranging from the Mk. I right through to the Mk. 24. Spitfire II also includes nine rare wartime colour photographs of aircraft and personnel. The pictures of the all-blue PR.XI will be especially interesting to many enthusiasts. I have found these books to be a valuable source of reference and inspiration since finding the first volume tucked away in a small Canberra bookshop some years ago. Robert Bracken has compiled a fascinating slice of history for anyone interested in either Canadian military history, Spitfires or the air war in Europe in general. Both books are a terrific read with a wealth of reference photos and artwork.